Why should I use Ross? Can my 072 engines run throught a Regular switch? Why is the Regular better for a crossover than an 072? Where does the name Ross come from? Does your switch have a non-derailing option? What gauge wire should I use? How often should I connect power to my track? How do I clean my track? My rollers are sparking...what is causing that? What is the difference between Superline and Premier line switches? Will magnatraction work on Ross? My magnetic couplers are activating...how do I fix that? Will my slide shoes pick your switch? Can you make 2-Rail track? Can my pre-war engines run through your switches? Can I run scale wheels through your switches? Are you ever going to make S gauge switches? Our switches are hand made with extremely tight tolerances. We use our SuperFrog II design. This is a one piece frog machined in house. Since it is machined and is not hand bent rail pushed up against a wedge insert we can control the height of the Frog. What this means in laymans terms is that at this most critical part of the turnout your trains glide through like they were on a piece of track. Also the angle or radius of departure is exact and specific to each of the 45+ switches we make. NO FUDGING! The wing rails on these frogs are ramped so as to not catch stray slide shoes, and the flange way has depth control so the wheel doesn't drop into the frog but glides smoothly through. The points are also CNC milled from solid rail stock specific to each switch. NO FUDGING! The Guardrails are solid aluminum and low profile so as to not catch stray slide shoes. The rails are both SPIKED and BONDED to a REAL WOODEN TIE plate and has an interconnecting wooden stringer glued underneath that makes up our TIE LOCK system. This prevents the ties from swimming around on you. NO PLASTIC MOLDED TIES. We have many different sizes of track from 031 diameters to 0128 diameter. Our track and switches are made with roll formed tinplated steel rail on the outside rails and roll formed oxidized steel rail for the center rail. The roll forming leaves you will a very prototypical flat top and slightly rounded edge. It is not sharp so your wheels and rollers will be safe. Sharp edges can notch your equipment. Since our rail is roll formed, sections are connected via a flat track pin. 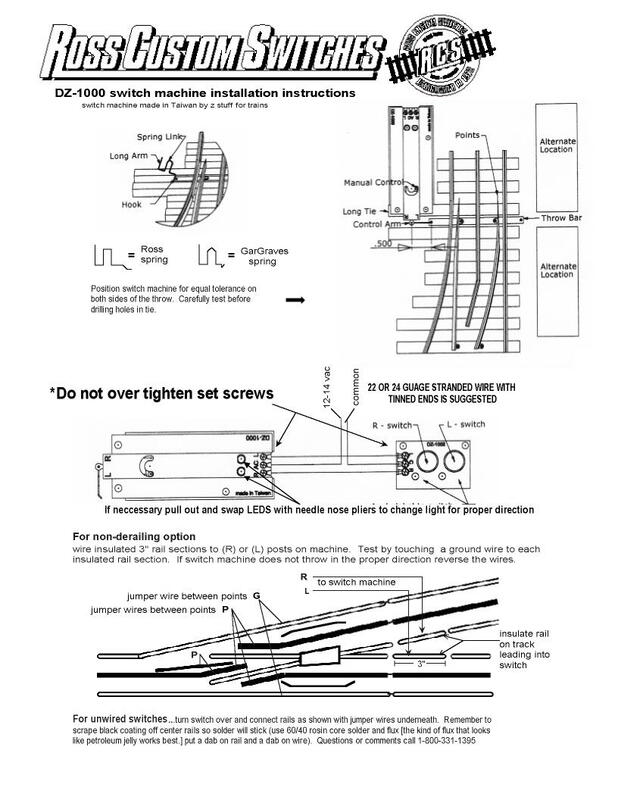 This is important because a rail joiner that connects the bottom of your rail does not necessarily align the tops....that is where the train's wheels are rolling. The pinned connection forces the tops of the rails together. Another advantage to track pins is the ability you have to easily cut and re-pin pieces for exact fits. With our versatility you can tell your track and switches what to do and not be told by them. If you are already using a different track system. No worries! RCS can adapt to almost anything out there. We have mating pins for "O", and “O27". The standard Atlas joiner will work with our rail, and Gargraves uses the same flat track pin that we do. RossReady is the name we use for our remote switch. This has the lighted DZ1000 machine mounted on the turnout and a lighted push button controller in the box . The turnout is wired for power throughout the entire length (the center rails are connected and the two outside rails are connected) so your trains will have power from one end of the switch to the other. Yes, with ease. The Regular (#100 and #101) is much more gradual than an 072. If you had to put a number on the curve in the regular it would be over 100" diameter. When you put two Regs together to create a crossover you are butting two straight legs together so the train slides gradually from track to track. When you put two 072 switches together you are butting two curves in opposite directions forcing the train through an S curve. The regular is usually the best choice for crossovers and straight passing sidings and the 072 is better if you are going directly into a circle and you want to keep it concentric. The name Ross comes from the Owner of our company's middle name. Steven Ross Brenneisen. Now try to say Brenneisen Custom Switches 10 times fast....... Yeah, I thought so. I know that those of us who answer the phone here are aware that most people can't say it once. We suggest using 16 or 18 gauge wire to get power to your layout, depending on its size. For larger layouts run a larger gauge bus wire underneath your benchwork and tap of from that to your track about every 6 or 8 feet. For DZ1000 switch machine, which require very little power, we recomend 22 to 26 gauge stranded preferably with tinned (soldered) ends. This will help the set screw bite into it without splaying out the strands. As with all track systems the current will dissipate without enough connections. You should connect power to the track every 6 or 8 feet. This will ensure a more hands free operation without your trains slowing down or speeding up on different parts of the layout. Run a heavy gauge bus wire for common (ground) underneath the layout and make sure you tap into that often. You should clean your track with rubbing alcohol on a clean rag. This should always be done with new track to take off any excess oil that was used in the manufacturing. If you use an abrasive material you run the risk of scratching the rail. Over time this can create pockets on the tops of your rails for dirt and oil to nest in. You will then have to clean the rail much more often than you would otherwise. If you haven't run your trains in a while, sparking is natural. After a few loops it will usually stop. If your trains are still acting sluggish after a running, dirty track is usually the culprit. (refer to question “how do I clean my track”). If you are getting big sparks you may be shorting, make sure that you haven’t crossed the common and hot wires. Superline switches are made to more traditional model RR dimensions, such as 031, 072, 054…etc. They are not true to scale. Our premiere switches are made to scale dimensions and are generally longer and more gradual. We use actual RR nomenclature to signify the sharpness of the switch. The higher the number the more gradual. Real RR do not have curves through the entire turnout portion of the switch, only the center has the curve until it gets to the proper angle and then is goes straight. This is better for crossovers because you avoid the S curve that an 072 will give you. All of our switches are made with the same material and build quality. Both Superline and Premiere may be used in the same layout, but with different applications. Here is where we confuse you. The regular switch is made like a premiere switch (all three legs are straight with the curve in the middle) but the regular remains in the Superline because it is about 1.5” shorter than a scale #5 switch would be. We designed it to be a direct fit to replace the old pre 1996 GarGraves switch. Yes. RCS uses tinplated steel rail. Magnetraction does work. Other brands that use nickel silver rail will not support magnetraction. Again, this is because the coupler is hanging too low and grazing the center rail. If you are having them activate over the switch you can fix that. Take a piece with a roller (like a lighted caboose) and watch it as it passes through the switch from black center rail to black center rail. You will see that the roller comes off the center rail before it ends. The rails are this long to make it easier for a wiring jumper to be put in. That last part of rail that slide shoe passes over but the roller misses can be insulated with a small strip of electrical tape and your problems should be solved. They may. That depends on your piece. Lionel had no standards for slide shoes. Remember they were building toys and did not conceive of the fantastic choices you would have for building a hi-rail layout today. Some of those shoes hang down too low, some hang more to the right and some hang more to the left. Real railroads cannot have equipment hanging down between the rails. This would lead to disaster. When building a turnout that looks and acts as prototypically as RCS turnouts do, slide shoes can be a problem. That said, we have eliminated many of the trouble spots for slide shoes. We have ramps milled into the wing rails of the frogs and our guard rails are slightly lower than the main rails. If you are going to have trouble it will be on the ends of the black center rails in the middle of the switch. There is a fix. We urge you push your slide shoe equipment through and if there is a catch you can either bevel down the ends of those center rails with a dremel or stick our regular #903 flat track pins in the ends of the rails and bend it down slightly. This will ramp up and over a stray shoe. We like to take a fine file and be sure there are no burrs on top of the rail where the pin goes in. Please note that no company has defeated all slide shoe issues, even Lionel who designed them in the first place! Yes, by special order we will be happy to make 2-rail track for your display case or 2-rail trains. The pre-war engines with the deep flanges on the wheels will ride up and bump onto our frog that is specifically manufactured for today’s flanges. Some people who are running those trains have made trenches in the frog to accommodate those flanges. This will negatively affect the smoothness of operating modern flanges. The scale wheels have very small flanges and miss our low profile guard rail. What we have done for people in the past was to send them guard rails made from our regular height rail. Also scale flange wheels will fall into the frog that are manufactured for tinplate style wheels. This doesn't always result in a derailment but can affect the smoothness of operation. We are now making a #4 S-gauge switch and have plans for an 038 and a 4-way. © 2019 Ross Custom Switches, All Rights Reserved.